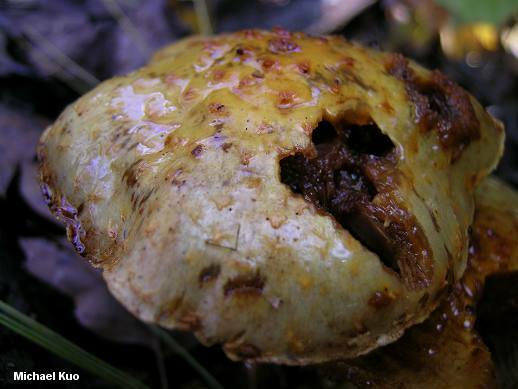 Pholiota limonella is a big, orange-yellow slimeball that grows in clusters on downed logs, standing dead trees, and stumps--and in the case of the latter, mushroom hunters should be advised that creepy little girls might emerge from the stumps. This, anyway, is what Hillary Swank discovers in her latest movie. 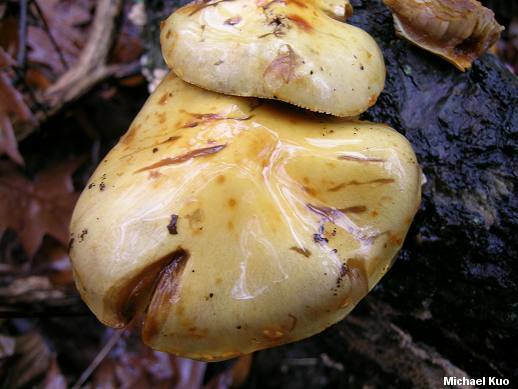 Hollywood offers mushroom hunters an occasional thrill: the pholiotas Swank ignores in The Reaping; honey mushrooms in Lord of the Rings; polypores in Robin Hood: Prince of Thieves and The Contract. You are truly a myco-geek when you reach for the remote to zoom in and advance the movie frame by frame in order to identify mushrooms in the background. Unfortunately, since Swank does not stop the action to section one of the mushrooms and analyze it microscopically, we can only label them "Pholiota limonella" in a wide sense, using the name to represent a group of similar species. 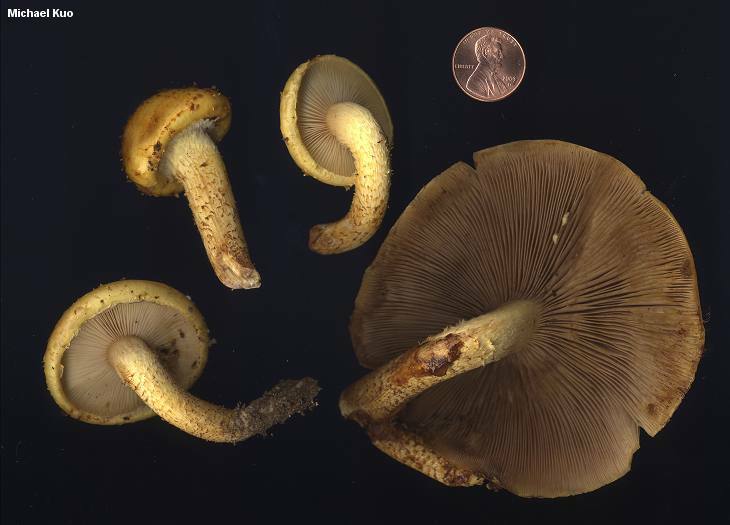 Defining features for the group include the slimy orangish to yellow caps, which feature scattered brownish to reddish brown scales--and the dry, somewhat scaly stems. Within the group, identification with precision requires microscopic analysis or the ability to conduct "mating studies" in a mycological laboratory; see the discussion below. Note: This broad description follows the biological species concept of Farr, Miller & Farr (1977) and Jacobsson (1987); see the comments below. Ecology: Saprobic and probably parasitic; growing alone or, more commonly, in clusters on living or dead wood; frequently found on the wood of birch and alder, but also documented on a variety of hardwoods and conifers; summer and fall; probably widely distributed in North America. Cap: 3-13 cm; convex, becoming broadly convex, broadly bell-shaped, or nearly flat; sticky or slimy; orange-yellow to yellow; covered with brownish to reddish brown scales that are soon scattered and often gelatinize, disappearing or becoming indistinct by maturity. Gills: Attached to the stem; close; whitish to yellowish when young, becoming rusty brown; at first covered by a whitish to yellowish, cobwebby partial veil. Stem: 4-15 cm long; up to 2 cm thick; dry, or sticky near the base; silky near the apex; with a flimsy ring or ring zone (often indistinct); whitish to yellowish under reddish brown to brownish or yellowish brown scales that may be scattered or densely packed; base sometimes covered with whitish mycelium. Chemical Reactions: KOH red to orangish on cap surface. Spore Print: Rusty brown to brown. Microscopic Features: Spores 6-9 x 4-5.5 µ; smooth; more or less elliptical; with an apical pore; brownish in KOH. Pleurocystidia clavate to clavate-mucronate; up to 65 x 13 µ; often with greenish yellow contents (chrysocystidia). Cheilocystidia variously shaped; up to 45 x 16 µ. Pileipellis a gelatinized layer of hyphae 2.5-7.5 µ wide. Clamp connections present. Pholiota abietis, Pholiota connata, Pholiota squarroso-adiposa, and Pholiota subvelutipes are synonyms (see below). REFERENCES: (Peck, 1879) Saccardo, 1887. (Saccardo, 1887; Overholts, 1927; Smith & Hesler, 1968; Farr, Miller & Farr, 1976; Scates & Gospodnetich, 1981/2003; Jacobsson, 1987; Phillips, 1991/2005; Holec, 1998; Matsumoto et al., 2003; McNeil, 2006.) Herb. Kuo 10160405, 10280401, 11010501. Pholiotas can be cultured in the laboratory fairly easily, allowing mycologists to experiment with "mating studies" in which mycelia cultured from collected specimens are introduced to one another in petri dishes. After drinks and conversation, some mycelia grow together, fusing their cell walls with clamp connections and exchanging cellular fluids--while other pairings don't work out and the mycelia turn up their noses at the prospect of "intercompatibility." Results from these experiments support arranging pholiotas as "biological species," using roughly the same concept of a "species" that we often use with animals: if they can mate and produce offspring, they are the same. 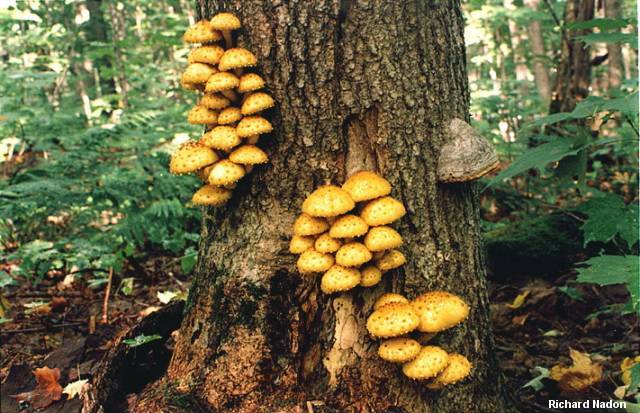 Mating studies on Pholiota limonella and similar mushrooms (Farr, Miller & Farr, 1976) revealed that several species previously defined on the basis of differences in physical features were quite willing to mate, suggesting that Pholiota limonella is a physically variable species. Pholiotas matching the physical descriptions of Pholiota limonella, Pholiota abietis, Pholiota connata, Pholiota squarroso-adiposa, and Pholiota subvelutipes were all compatible; since Pholiota limonella is the oldest species name in the group, the authors followed taxonomic rules and reduced the other names to synonymy. 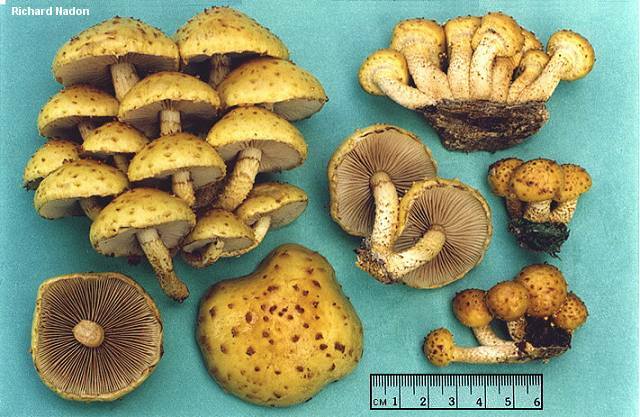 Specimens matching the description of "Pholiota aurivella," however, were not compatible with the others. Since the description of Pholiota limonella had to be widened to accommodate variation in physical features, the authors found precious few physical features that adequately separated Pholiota aurivella from Pholiota limonella--except for spore dimensions; the spores of Pholiota aurivella collections were somewhat larger (8.5-10.2 x 5-6.5 µ). 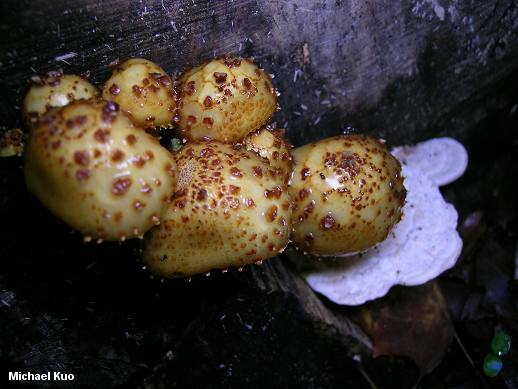 Subsequent mating research (Jacobsson, 1987) and morphological analysis (Holec, 1998) has upheld the broadened concept of Pholiota limonella and its separation from closely related species on the basis of spore dimensions. 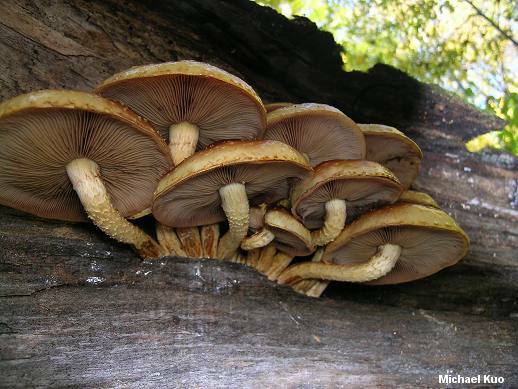 While a few DNA studies (Moncalvo and collaborators, 2002; Matsumoto and collaborators, 2003) have included specimens identified as "Pholiota aurivella" and "Pholiota limonella," they have not focused on the question of these species and their separation, and a DNA study of this group based on well documented contemporary collections--counterbalanced with evidence from morphological study and mating analysis of the same specimens--is desperately needed. For now, spore measurements appear to separate Pholiota limonella. 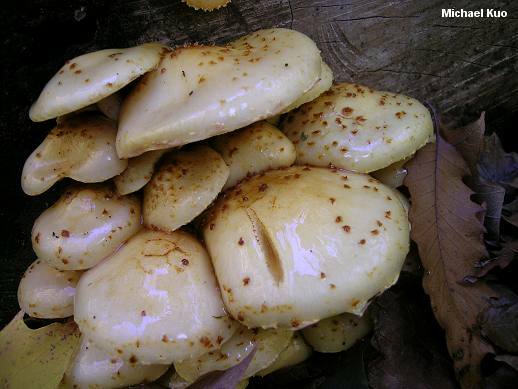 If the mushroom you collected has larger, aurivella-sized spores, however, I suggest calling it Steve--because, otherwise, you will soon find yourself in Pholiota Hell, where mycology gets very ugly. At issue is whether Pholiota aurivella and Pholiota adiposa are separate species--but I will leave this topic for another day.